We end our look back at PHW in the 1970s with a milestone celebration for the organization. Most likely due to the revolving fund and other activities in the busy year 1974, the organization missed commemorating its tenth anniversary, but instead celebrated its 15th anniversary in 1979-1980. (1) A number of commemorative items were produced for the organization that year, including a plaque donated by Mary Henkel to record the PHW founders for posterity, a plaque noting Carroll Henkel as PHW’s first president, and a delicate calligraphy record of PHW’s history to date lettered by B.J. Eastep. (2) These plaques currently hang in the foyer at the Hexagon House. Preservation of Historic Winchester, Inc., was organized in 1964 by concerned members of the community for the purpose of safeguarding the heritage of the City and assuring a quality of life for tomorrow represented by the best of Winchester’s past. To the end that this goal may be encouraged among the people and the charm of the City maintained and improved, PHW has, through a program of education, enlisted sympathy for and participation in the preservation, restoration, and ownership of sites, buildings, structures, and objects significant to the cultural, social, political, economic, and architectural history of Winchester. A major goal of PHW is to preserve the visual heritage of the City by saving old buildings and encouraging their use for present day needs. The W. Raymond Jennings Revolving Fund was established in 1976 as a source of money used to purchase properties of historic and/or architectural significance and resell them with protective covenants. Since its inception, the fund has bought and sold 26 buildings in the Winchester Historic District, the majority in the “Potatoe Hill” area of South Loudoun Street. eleven of the buildings are of log construction and at least seven date back to the 18th century. The Virginia Historic Landmarks Commission recognized the preservation efforts of the City of Winchester and PHW in the spring of 1979 by designating the Winchester Historic District as a Virginia Historic Landmark. And, at present, Winchester’s Historic District is awaiting inclusion on the National Register of Historic Places. As PHW enters its sixteenth year, the organization has much to be proud of. Historic preservation has gained increasing acceptance in Winchester and throughout the nation. Not only are grand old homes being saved, but also entire neighborhoods and commercial districts. As residents rediscover links to the past, merchants realize that preservation is indeed good business. With over 700 members, PHW is now the largest volunteer organization in the City. Interesting lectures and tours throughout the year help to increase membership, educate the public, and enlist sympathy for, and participation in, preservation and restoration. Winchester: Limestone, Sycamores and Architecture was published in November 1977 by PHW. This book, written by nationally-known author Walter Kidney and photographed and designed by James Morrison, is the first comprehensive book on Winchester’s history and architecture. PHW is recognized as a vital force in Winchester and with the enthusiastic support of its citizenry, one can understand why, in Winchester, Virginia, the past is looking forward to the future. The Annual Meeting in 1979 was dedicated to recapping the organizational history in five year increments. Tom Scully covered the formative years of PHW from 1964-1969, Katie Rockwood tackled the formation of the Jennings Revolving Fund from 1969-1974, and Dave Juergans reviewed PHW’s modern era of the architectural survey and the subsequent Virginia Historic Landmarks Designation and publication of the Limestone, Sycamores, and Architecture book from 1974-1979. This was also the inaugural year for PHW’s preservation awards, now a staple of our June Annual Meeting. The honored projects of 1979 included the Revolving Fund property of the Andrew Baker House at 702 S. Loudoun St., adaptive reuse of the 1930s bus terminal by Nobel Travel Agency, and the new addition at the Handley Library for new compatible construction and interior restoration work. 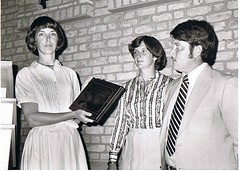 Be sure to visit the Flickr album for more images from the 1979 Annual Meeting. Next Next post: Historic Church Tour in Old Town This Saturday!